It’s June…we’re on Summer Vacay…so we’re shooting On Location in Atlanta this month! We have some fun stuff in store this month! I’m so excited to kick off the month with Mom’s famous French Crepes! If you’ve read any of my blogs before or watched any of my Tiny Kitchen Big Taste YouTube videos, you will know that my family has been a huge influence on me when it comes to cooking. Everything I know started by watching them or trying out one of their recipes. 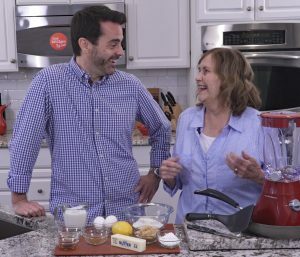 Today, we are not only featuring my Mom’s Crepes recipes, she is actually in the kitchen and cooking them up with us! 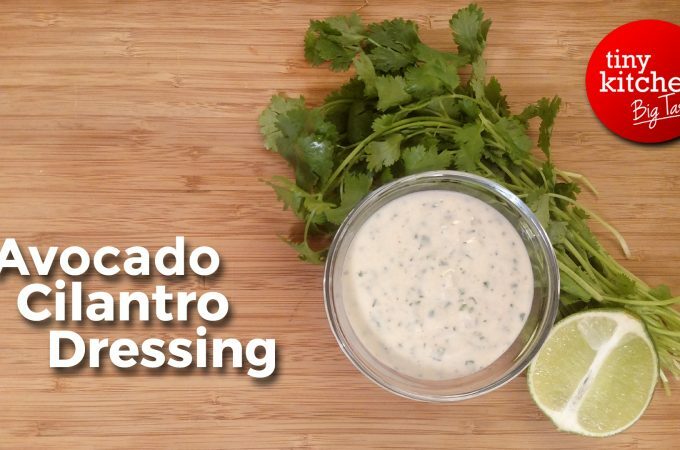 This makes me so happy and I love that you get to learn the recipe straight from her! I remember having these Crepes as a kid and, even now, I request them all the time! Of course, I have to fight my niece and nephew for the scraps as they will tear through them like their going out of style. 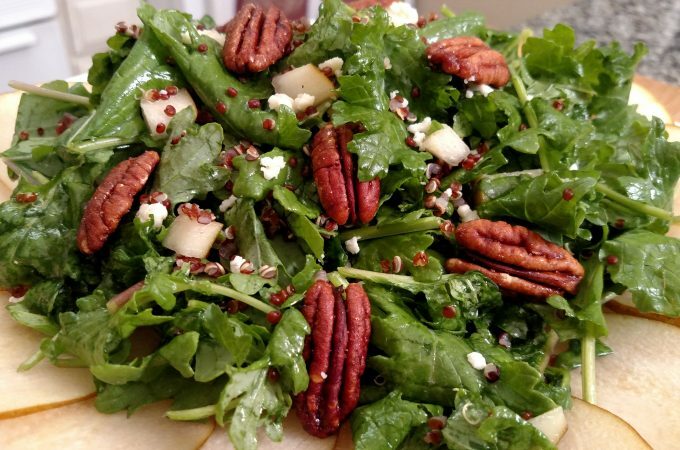 Inevitably, what starts off as one recipe turns into making a second or third batch! Once you try these Crepes, you’ll see why. Crepes are great, not only for breakfast, but also for dinner. Generally speaking, you can have a sweet crepe (crêpes sucrées) or a savory crepe (crêpes salées). The one’s we’re making today are sweet crepes because they are made with All-purpose flour, which is a type of blended wheat flour. Savory crepes are generally made with a non-wheat flour. This distinction gets blurred a little these days, though, as many folks generally classify a crepe by what you put in it. For example, if you are going to put brown sugar, butter, Nutella, whipped cream, lemon juice, powdered sugar, ice cream maple syrup, custard, preserves, fruit or any combination thereof, then you’re talking about a sweet crepe. They’re perfect for breakfast or even a fancy dessert. Now, if you want to stuff it with other things like chicken, ham, cheese, eggs, mushroom, cream sauce, tomato sauce, pesto or something like that, then you’re talking a savory crepe…which is perfect for dinner. 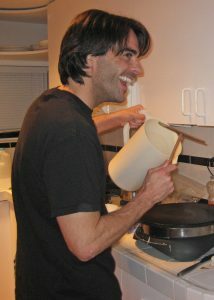 Several years back, I attended what I consider to be one of the coolest ideas for a party…if was a crepe making party. They had two crepe makers, which essentially are glorified frying pans with their own heating element…and they tend to be much larger so you can make larger crepes. One maker had a variety of sweet items next to it and the other was a savory station. You could step up and make your own crepe and stuff it with what ever your wanted. I thought it was such a novel idea! I had never been to anything like this before. Plus, you could make a dinner crepe…and then later on, make dessert. As we’re cooking in a smaller kitchen and we have more limited cookware (or space for that matter), a regular frying pan will work just fine! Non-stick is preferred. Rub it with a little vegetable oil…that will help to encourage the non-stick to cooperate. If you don’t have nonstick, then a little more oil will likely be necessary. As Mom says in the video, the first one generally doesn’t get golden brown. I find the same to be true when making pancakes. I call that the chef’s crepe or pancake…the taste is still good. Once things get going, you can know out these crepes in no time flat. Like Mom suggested, if you’re making crepes for more than a couple of folks or you just want to have some on hand for breakfast throughout the week, make them in advance and store them in the fridge. If you have wax paper, that helps to keep them separate. If you don’t, though, just let them thoroughly cool before you put them in the fridge…that will help to stop them from sticking together. When you’re ready to serve, fill them up with whatever goodies you want! Mine favorite is the classic brown sugar and butter that I had as a kid…of course, I like to drizzle a little maple syrup on top, too, for good measure! But I want to hear from you!!! 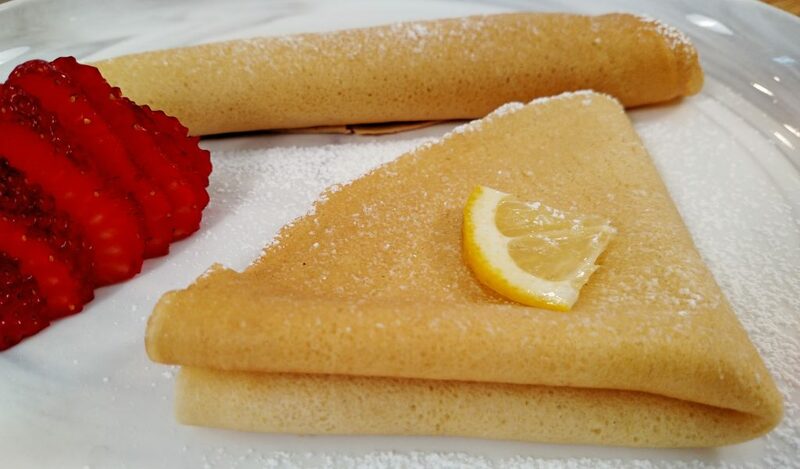 Tell us what your favorite crepe is…and even better, try making one and post a picture of it on Instagram and tag us in it (@tinykitchenTV). I just love seeing what y’all come up with. Mom's crepes are addictive...you might have to make a double batch! Add Milk, Eggs and Vanilla to a Blender. Pulse until blended.Mix Flour and Cinnamon in a small bowl. Add half to the Blender. Add remaining Flour and Cinnamon. Blend until well mixed. Let rest for at least 5 minutes.In a frying pan over medium heat, add a small amount of Oil and wipe with a paper towel.Place 1/4 cup of the crepe batter and spread around pan until it fills the pan.Cook until the edges start to lift up on the side and the bottom is golden brown. Flip and cook until golden brown on the bottom. 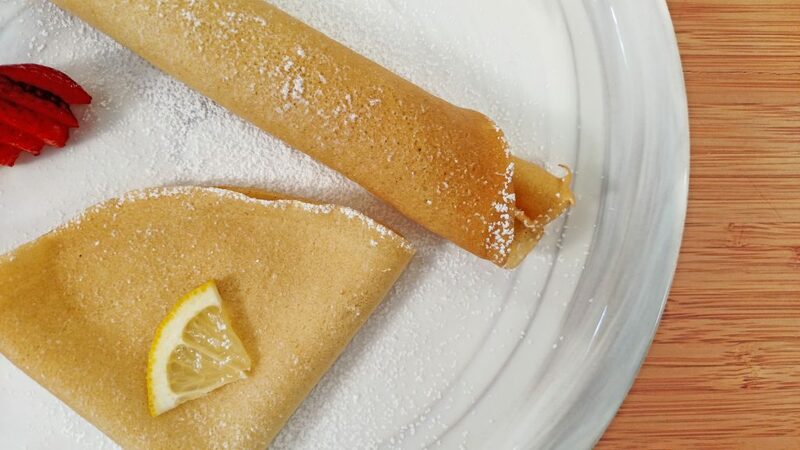 Repeat until all the batter is used.Fill with crepe with Butter and Brown Sugar and roll -or- fill with Butter and Lemon Juice, fold in half, then fold in half again. Top with Powdered Sugar.Enjoy! 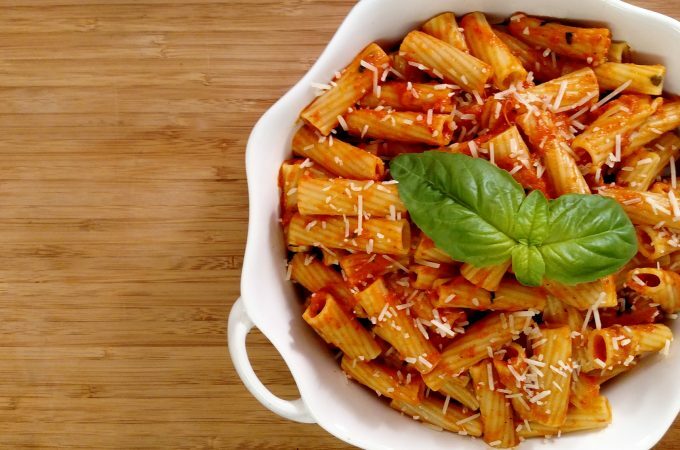 The Best Tomato Sauce Ever!